Since Magnum I have liked PI's in the Hawaiian area. Because of that I was eager to learn more about the Surfing Detective and the author Chip Hughes. Q: What makes Kai Cooke (the Surfing Detective) different from other hardboiled characters? The definition of the classic hard-boiled PI (or the cliché that it has sometimes become) fit less well a laidback surfer in Hawai‘i than it does the tough-talking, trench coat-clad gumshoes in the cold, hard cities on the mainland. Kai Cooke musters toughness when he needs it, but his approach is generally more low-key and soft-spoken, in keeping with the way things are done in the islands. He owns a Smith & Wesson .357 Magnum, though seldom uses it. He quietly contemplates his cases while sitting on his board and waiting for the next wave. “Sherlock Holmes had his pipe,” he tells us in Murder on Moloka’i. “I have my surfboard.” Wherever a PI operates, he or she needs to adapt to local circumstances. So in this way, I suppose, Kai is not unlike other PIs—except he probably bangs fewer heads and enjoys more sunshine. And, of course, more waves! In keeping with the island theme of the series, I felt my PI should be someone who was uniquely of the islands. Kai Cooke (originally named “Keahi”) was first conceived as part-Hawaiian and a sailor. Then two things became clear: 1) As a non-Hawaiian, I could not write authentically from the point of view of a native Hawaiian. So I decided that Kai would be haole (Caucasian) and hanaied (adopted) by a Hawaiian family. 2) Kai would also be a surfer (rather than a sailor), because surfing is Hawai’i’s gift to the world. It made sense that a mystery series attempting to capture the flavor of the islands would have a surfer as its PI. Kai Cooke’s first name means “sea” and his last name comes from a famous kama’aina (longtime island resident) missionary family. He was adopted by Hawaiian relatives at eight when his parents died and left him an orphan. As the series begins he’s thirty-four and single. He rides a longboard, drives an old Impala, and has no wife, no children, and no pets. When he gets lonely, he has a knack for falling for the wrong person. Usually with dire consequences. He has no shortage of dates, and no shortage of lonely nights. He carries his board with him wherever he goes inside his car. And under his khakis, aloha shirt, and sandals he wears board shorts. Surfing is his sanctuary. What eBooks—and also print-on-demand books—have done for self- and Indie-publishing can only be described as you have: a “revolution.” Before this happened a small number of national and regional publishers essentially controlled what books were printed. Now any individual can publish his or her own book in digital and paper form at very little expense and, via the internet and social media, can promote books in a way that was never imaginable before. A true breakthrough for the little guy. Amazing. Q: What's next for you and Kai? 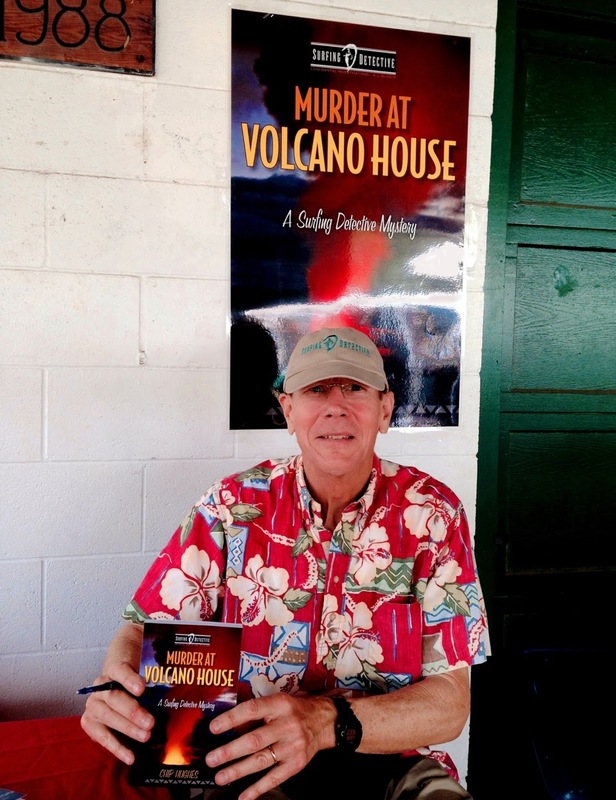 My plan from the beginning for the Surfing Detective series was to write six books, each featuring one of the six main inhabited islands in the Hawaiian chain. The four books that have been published so far haven’t exactly followed the plan, but close: Murder on Moloka‘i, the first book, is set on the Friendly Island; Wipeout!, the second, features the famous surfing breaks of Oahu’s North Shore; Kula, the third (about a stolen golden retriever), takes place on three islands (O‘ahu, Maui and Hawai‘i); and Murder at Volcano House, the fourth, at Hawai‘i Volcanoes National Park. I plan to set the two remaining books on Kaua‘i and Maui, respectively. We’ll see what happens! In any case, you can expect more island-hopping sleuthing from Kai Cooke. My wife and I both come from large families on either US coast. Since family is a big part of our lives, we travel a lot to see them and they frequently come to see us. I also surf when time allows. I am a member of the Golden Retriever Club of Hawai‘i and participate in rescue (that’s how we got our golden). I am a member of the Porsche Club of America, Hawai‘i Region. Finally, after retiring from college teaching I’ve taken up the piano; I adore the instrument and its repertoire. Other tidbits: I eat mostly vegetarian (my wife is a superb cook), she and I jog and walk and do a little yoga, we’re into sustainability and are transitioning to all-solar power for our Hawai‘i home, our cars run on 100% biodiesel (except the Porsche—we’re waiting on Stuttgart to offer an all-electric or biofuel car), and we are advocates for peace (I am a Vietnam-era veteran) and have been known to march and carry signs to that effect. 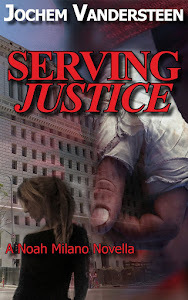 The Surfing Detective website & blog—http://surfingdetective.com—Facebook, Twitter @surfingdetectiv, and giving away free ebooks every Sunday. I just finished judging a PI hardcover novel contest that included 70 books by well-known authors and newcomers alike. What I learned encountering all of these books is that the sub-genre of the PI novel (the main genre being “mystery”) is proliferating into various sub-sub-genres, each with its own writers and (apparently) readers. For example, there are books featuring animals and pets; ghosts and vampires; cooking and culinary arts; CSI and forensic procedure, historical periods and events, including westerns; priests, nuns, and religious orders; stories with an essentially comic tone, etc. Fewer books than one might imagine followed the Hammett and Chandler hard-boiled school—while Parker’s books continue to be written by surrogates under the auspices of his estate. (Dennis Lahane did not enter the contest this year.) Since the PI novel has proliferated with new writers who bring with them interests in other genres and other subjects, the pertinent question might be not “who” will influence them, but how many new and different directions will they take? I started writing in the genre in the late 1980s and early 1990s, which was, in my opinion, the golden age of “Mystery!” on PBS. Night after night I watched British productions of Jeremy Brett as Sherlock Holmes, John Thaw as Inspector Morse, David Suchet as Hercule Poroit, Joan Hickson as Miss Marple, and others. These actors are (the last episodes of Poroit air this year) and were masters. And the productions they starred in are of extremely high quality. I wasn’t a mystery reader at the time, but these excellent television programs lured me to the printed works from which they were adapted. I began to teach a mystery course at the University of Hawai‘i, and not long after tried my hand at writing a mystery. So I guess you could say I was inspired to write a book by a TV program! Excellent interview and what a cool new PI character. Wish you the best.